Acute Dialysis Quality Initiative Group (ADQI) group proposed RIFLE (Risk, Injury, Failure, Loss of function, End stage renal disease) criteria, criteria for defining AKI, later modified in children as pRIFLE (pediatric RIFLE). This study tries to address the need of limited data on pediatric AKI.... Acute kidney injury (formerly known as acute renal failure) is a syndrome characterised by the rapid loss of the kidney's excretory function and is typically diagnosed by the accumulation of end products of nitrogen metabolism (urea and creatinine) or decreased urine output, or both. ADQI Acute Dialysis Quality Initiative ADQI RIFLE Criteria for Acute Kidney Injury Risk Injury Failure Loss ESRD Increased creatinine x1.5 End Stage Renal Disease the art of theatre fourth edition pdf Acute kidney injury (AKI) is a common complication following cardiac surgery and predicts outcome. Nonetheless the occurrence rate and prognostic value of AKI after TA are unclear. Nonetheless the occurrence rate and prognostic value of AKI after TA are unclear. 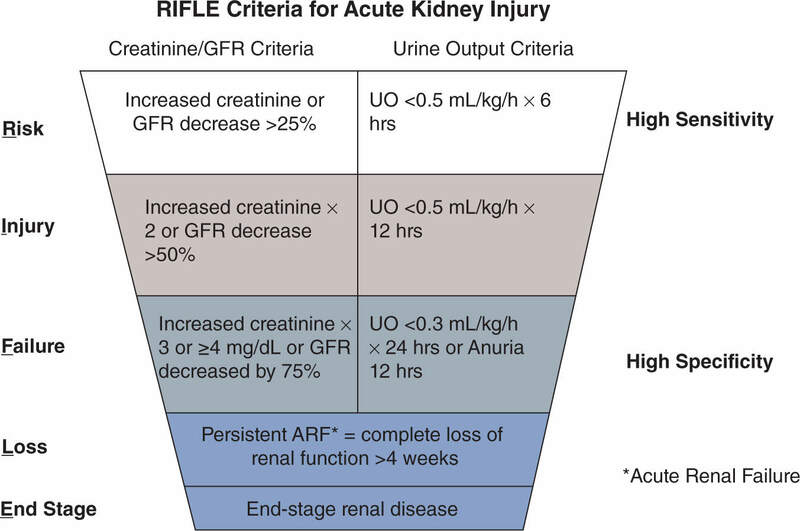 The Acute Dialysis Quality Initiative Working Group recently developed the RIFLE criteria, a consensus definition for acute kidney injury (AKI). We sought to evaluate the RIFLE criteria on the day of ICU admission in a large heterogenous population of critically ill patients.